A handsome, robust, squarely built, medium sized dog with aristocratic bearing, the Standard Schnauzer is the original of the 3 sizes of schnauzers. He is salt and pepper or solid black in color with a wiry no-shed coat. Standard Schnauzers are noted for absolute loyalty in guarding the home, coupled with affectionate devotion. The Standard Schnauzer is not the breed for those who want a slow, placid dog, or a dog that can be fed and forgotten, for they insist on being a part of the family activities and develop best when treated in this manner. For this reason, most Standards, even the top show winners, are house pets. They are outstanding companions, known for their devotion and love of the family. Although they may have favorites, they are not just a “one person dog”, but instead become a member of the entire family. As a home guardian, the Standard Schnauzer excels. He readily accepts friends of the family, but warns away strangers with a strong voice which he saves for such occasions. And woe unto the attacker or intruder! Standard Schnauzer is a medium sized dog. Males are between 18-20 inches high at the shoulders and generally weigh about 40-45 pounds. The Females are between 17-19 inches and generally weigh about 35-40 pounds. 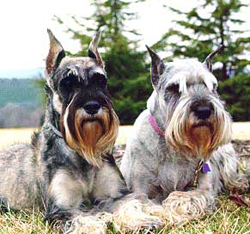 Standard Schnauzers learn quickly and excel in obedience and agility. Like a mischievous child they need a firm, but not rough, hand. They will get away with whatever they can and soon “rule the house” if allowed.